The Singapore National Women’s team is having an open trial on 28 March 2017. This trial is opened to players currently playing in the Premier League Teams including players from teams which recently got promoted from Division 2 to Premier League. The players, if shortlisted, will join the current training squad of 30 players in preparation for the up-coming WFC 2017 at Slovakia. 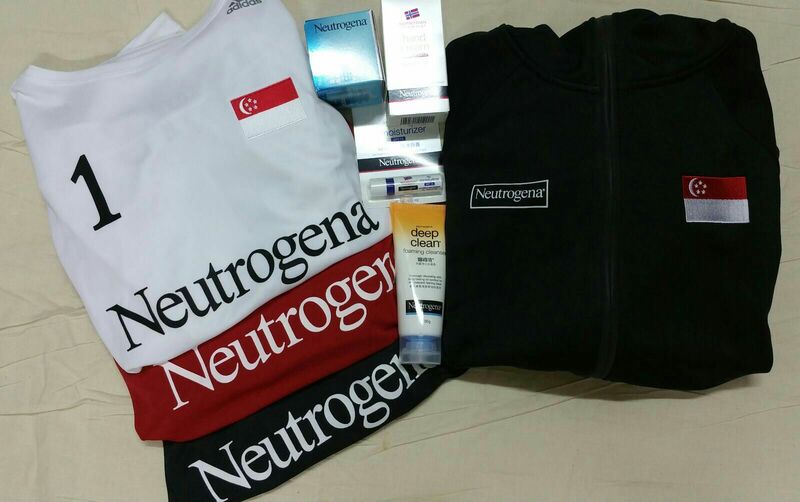 Along with sponsoring our kickass kit, we got some essentials- the Hydro Boost Water Gel, Neutrogena deep clean facial cleanser, hand cream and Neutrogena Norwegian Formula Lip Moisturizer. Author funfloorballPosted on December 8, 2015 January 11, 2016 Format ImageCategories Singapore National Floorball TeamLeave a comment on #NeutrogenaSG , thank you. Tampere, Finland reminds me how far away I am from my home. The cold can make your nose bleed. If we are able to see sunrise, that is a photo-taking worthy moment because the days are mostly dark (think 30 Days of Night). Even their famous amusement park is closed from October. And here we are experiencing all this and inter alia, battling floorball giants. Firstly, the send off by my teammates was beyond anything I expected. GOSH. It was quite a surprise for someone who does not like fanfare and attention. I appreciate it alot and I spent my flight times reading all your little notes. I can feel how much effort and sleep loss it took to make those cards and I am thankful. Sadly, our first of two training sessions were missed as our KLM flight faced a technical fault. Sitting in the plane, I fell asleep and woke up happily an hour later when I heard the pilot announce ‘Open the doors’. I looked out but the view stayed the same. Damn. We had to change planes. We ended up travelling for almost a day before we reached Forenom apartments. Lovely place! My roomies are Rury and Gracia. Best! And I got a bunk bed- childhood preference. Food here is pricey so our coaches planned our meals for the duration of our tournament – Asian delights once in awhile! Our first game against Australia was nail-biting. Rury and I were literally grabbing one another in the last few minutes of the game. Hui Hui scored two, Badi scored a beauty, Nat equalised and Jos scored the winning goal! We had a good time re-watching her goal celebration. Playing here is different from back home. The arena is chilly. I warmed my hands with the disposable hand warmers (Thanks Yalo!) until I accidentally tore it open and caused a black powdery mess on the Gerflor. Not glam! There is no such thing as water coolers. If you want water, you would be directed to the toilet sink. Yes, it takes getting used to but we experienced this during the Czech Open. Not a culture shock. The baths here are open concept showers. Many showers with no partitions. No doors. Team bonding maximus! On our second day in Tampere, we visited a primary school in the Leinolat district. The school had invited us for their Independence Day celebrations. The children had also prepared questions written on paper cut outs of our Singapore flag. The questions varied- Do you like Finland?, Why do you like floorball?, Have you been to Greece? and What is Singapore’s official musical instrument? The last question may seem odd. However, they asked because Finland does have one. It is called a kantele, a traditional plucked string instrument. Learnt something new! Later in the day, we played Japan. I am proud of the team for giving our close rivals a tough fight to the last second. Laura, Debbie and Nat got us the goals! Our team’s MOM was my roomie, Gracia! Our final group stage match was against 9th in the world- Denmark. We are 20th ranked. I played the 2nd and 3rd period. It was nail-biting. We fought back and even scored a goal during box play thanks to Yeo Xuan and Hui Hui. What’s more- Debbie scored a goal when we played 6 man. Do watch the goals. It was exciting stuff- plays not usually seen in local floorball, I’d say. Then again, that is what the World Cup is about. All or nothing. Kudos to our mini cheering squad from Leinolat School for making us feel like stars! After the match, we had an anti-doping talk across at the main arena where the top teams compete. Pretty cool to see this in real life instead of YouTube highlights in front of my PC screen. The IFF rules have changed thus we ended up 3rd in the table. We did not make the playoffs this time. No matter what, fighting hard as a team matters. We have two more matches. Our first game is against Netherlands later today. Thank you for all the support back home- for watching the matches and giving me advice and encouragement all the way even in wee hours of the morning. Being chosen to wear the flag is my childhood dream come true and an immense honour. The national anthem will now hold even more memories too! 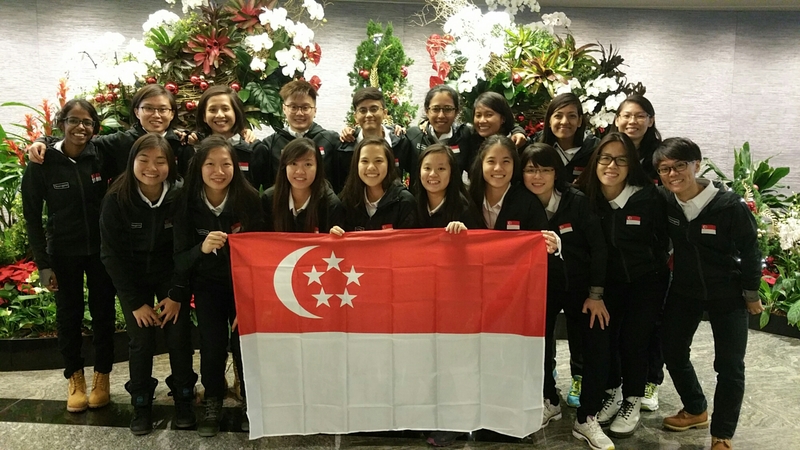 Off to the 2015 World Floorball Championships! 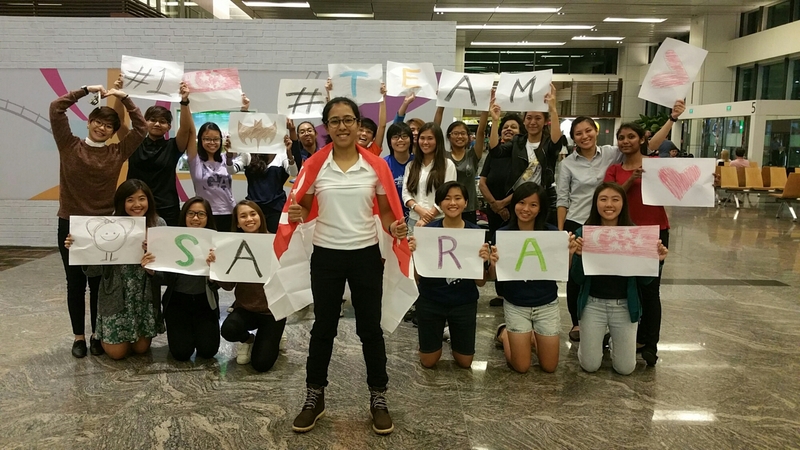 The girls sent off our national goalie Sara, as the Singapore Women’s Floorball Team head off to Tampere, Finland for the 2015 Floorball World Championships! Remember Sara that we have your back to the Finnish line! Updates on Team Singapore’s matches will be posted on this website too! 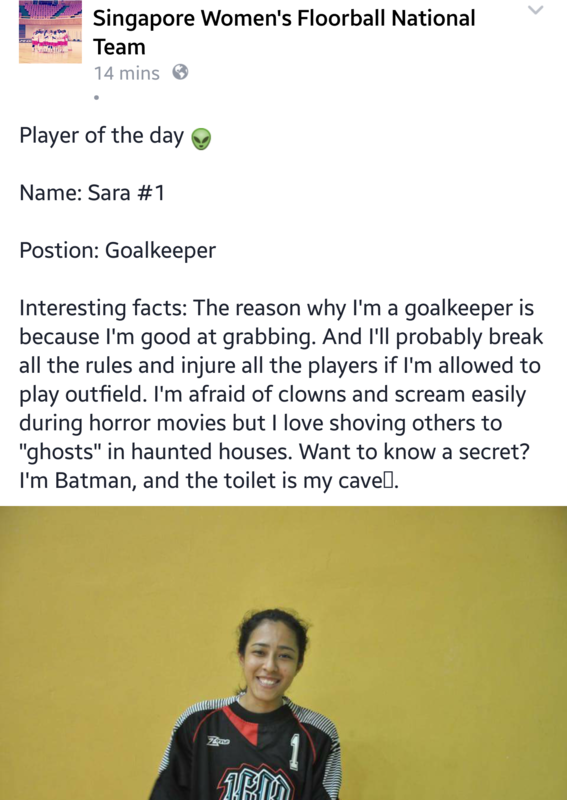 Author funfloorballPosted on December 3, 2015 January 11, 2016 Categories Singapore National Floorball TeamLeave a comment on Off to the 2015 World Floorball Championships! 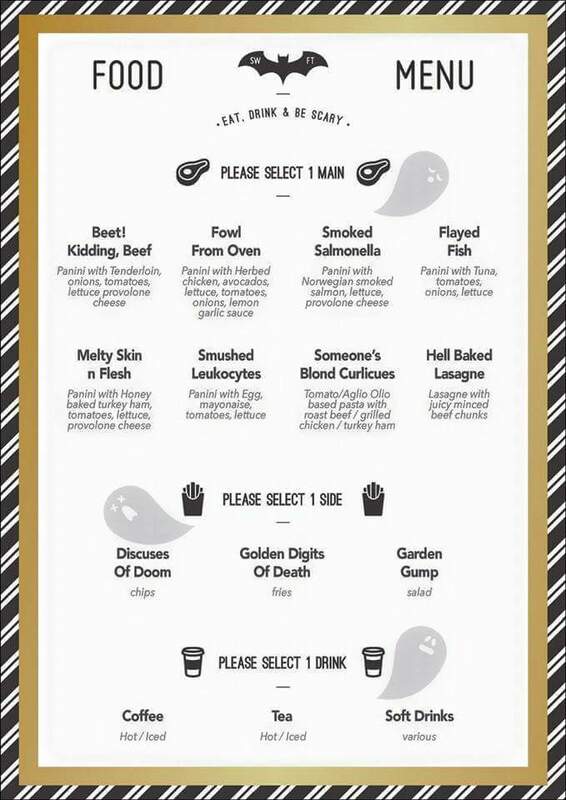 Author funfloorballPosted on October 20, 2015 January 11, 2016 Categories Singapore National Floorball TeamLeave a comment on No plans for Halloween? 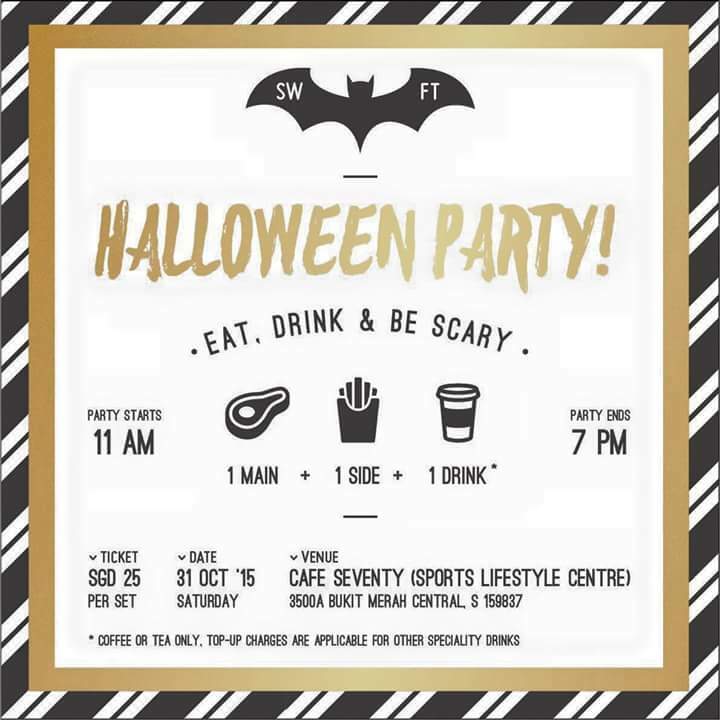 Author funfloorballPosted on October 7, 2015 January 11, 2016 Categories Singapore National Floorball TeamLeave a comment on SWFT Wants Taylor SWiFT!